Around 20 participants representing different stakeholders in the construction sector gathered on a chilly Thursday in late October in Floda, a small town near Gothenburg. One of the principles of the living lab process is to take the participants out from the familiar office environment, to the “field” and to the projects where circular economy principles are being implemented. Unlike an ordinary laboratory, where the point is to work in a controlled environment, a living lab is a laboratory based on and operated in the real, uncontrolled environment, i.e. the real environment that we all live and work in, every day. The work starts in reality, with user participation, cooperation in the creation of knowledge and solution development. Therefore it is important that the living lab consists of a mix of actors, resources and activities, in order to ensure that the true focus and end-user perspective is always is included. The first, introductory meeting, led by Hifab and SP, aimed to generate interest in taking part in the living lab events during the following two years and to build the foundations of a network working with circular material flow. Therefore, the day focused on raising knowledge about industrial symbiosis and FISSACs ambitions. The participants were given a chance to get to know each other, share their experience and understand each other’s perspective for fostering potential future collaboration. Read more about the activities, participants and future plans for the living lab in Sweden on the FISSAC webpage. Deliverable D2.2. Characteristics of waste streams and requirements for recycling processes. Based on the technical requirements derived from Task 2.1, this deliverable focuses on characterizing current industrial waste streams. The identified industrial waste streams can be composed of potential undesirable elements that could determine the physical and chemical properties for their use as secondary raw materials, in the target construction applications. Task 2.2 aims to characterize the current industrial waste streams. For each type of waste stream, at least 3 samples were collected from the industrial sites and then characterized at lab scale on the basis of the parameters defined in Task 2.1. Basic characterization of raw waste materials has been carried out on the following approaches: physical-mechanical, chemical, mineralogical, morphological and environmental ones. The waste characterization was conducted to establish the requirements for the improved innovative recycling processes aiming to achieve higher efficiencies in the recovery of the target secondary raw materials. This task will also provide Task 2.3 with information on gaps or areas for improvement in the recycling routes, as well as to adjust specific operation parameters in the eco-innovative recycling/treatment technologies. This task also identifies, potential lack of harmonized standards hampering full acceptance in construction applications (Task 2.5). Meet some of the partners! AENOR is the Spanish standardization body and the national representative and member of the European (CEN/CENELEC), International (ISO/IEC) and Panamerican (COPANT) Standards Organizations, and member of the European Telecommunications Standards Institute (ETSI). AENOR is responsible for the management and development of all the activities related to standardization in FISSAC. The integration of the project in the standardization system is expected to facilitate the acceptance and utilization of the outcomes generated by the relevant industrial sectors. The standardization activities’ aim to include project solutions in new or current standardization works with the objective of introducing the project outcomes into the market. Additionally, the project will have a precise knowledge of the current standardization works that can be useful for the development of the different working packages, contributing to compatibility and interoperability with what already exists in the market. Ingenieurbüro Trinius GmbH has more than 15 years of experience in sustainable construction. We contributed to a range of R&D projects paving the way for assessment methods and ultimately for green building labels. For about 10 years, we participated and led thematic work in international standardization. Our core competence lies in quantitative life cycle assessment of buildings, related both to economic and environmental sustainability aspects. Embedding these assessment methodologies in the context of sustainable construction and the concerns and decision context of our clients is our stronghold. As the task leader of Task 3.2 in WP3, Büro Trinius will work on the ecodesign of the new products by considering the economic, environmental, technical perspectives as well as market factors and innovation points, to provide a holistic sustainable concept and approach in product design and development. Glass Technology Services are the sister company of British Glass Manufacturers Confederation and provide technical services, consultancy and research and innovation in glass related areas. Their role in the FISSAC project, working with British Glass, is to provide glass expertise with the aim of increasing the amount of construction waste glass available for recycling both to manufacture new glass and alternative products in particular eco-cement. This task will be accomplished through a combination of practical work and conversations with stakeholders. Europe is the cradle of the world’s steel industry. In 2015, EU steel production was 166 million tonnes (source Eurofer), destined for the construction sector (33%), automotive (19%), mechanical appliances (15%), metal products (14% ), tubes (11%), household appliances (3%), transport (3%) and other sectors (2%). 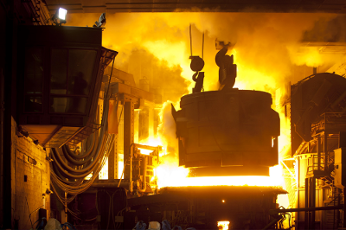 Out of all this steel, 60.6% was produced with the Iron-making technology. This manufacturing process takes the starting materials (iron ore, coal and fluxes) through a series of processes in order to obtain pig iron as the intermediate product and finally, steel as the finished product. The remainder 39.4% comes from electrical steel production technology that produces steel through electric arc furnaces, or recovering and transforming scrap metals from various sources (demolition, processing wastes, scraps, etc.) to obtain new steel. 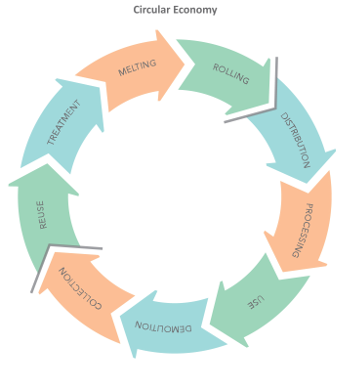 The latter technology falls fully within the logic of circular economy. It is increasingly engaged in the research of technologies and processes to reduce consumption and to recover scraps in order to put them back into the production cycle. The approach voted to “zero waste” has resulted in the search for new technologies that can transform waste materials in the production process of the steel sector into reusable secondary raw materials. Looking at electrical steelmaking, project going in this direction with a target for reducing consumption are increasingly finding recovery solutions. This is the case of the energy recovery and heat, or the processing of slag resulting from the production process in reusable secondary raw materials in another industry. The so-called “black” slag (from electrical arc furnaces) already are processed into granules certified suitable for the construction market starting them virtuously to an alternative route to the dump. “White” slags, produced at the ladle furnace in the refining stage of steel, are now the subject of the research project FISSAC so that even the lotus recovery can become one more step in the definition of a new business paradigm that materialize the concept of ” circular economy “. upcoming Living Labs to take place in different partner countries, ideas were discussed for the upcoming webinars currently being developed by FISSAC for a wider audience, as well as the continuous work with the FISSAC Industrial Symbiosis model. On 20 October, ACR+ presented the FISSAC project during the SwitchMed Connect 2016 conference (an annual gathering of stakeholders from the Mediterranean) in Barcelona. ACR+ Secretary General, Françoise Bonnet, presented FISSAC during the session “Industry Track 4: Green Industrial Zones in the Mediterranean”, during which several leading examples of industrial symbiosis from the Mediterranean region were highlighted. workshop.The European Commission conducted a study on pre-demolition and renovation audits, addressing current practices and key factors, examining amongst others regulatory, technical, and economic conditions in the EU-28. The final results of this study will be presented on 9 December 2016 in Brussels.Additionally, the Commission recently introduced a Construction and Demolition Waste Protocol. These non-binding guidelines to the industry aim to increase confidence in the C&D waste management process and the trust in the quality of C&D recycled material. FISSAC will hold its first webinar in February 2017. This first webinar will focus on the FISSAC model, industrial symbiosis and best practices, as well as providing a brief introduction to the FISSAC tool which is currently under development. More information will be announced on the FISSAC website soon! The project RE4 was launched in September, including many partners of FISSAC within the consortium. The purpose of the project is to develop a RE4-prefabricated energy-efficient building concept that can be easily assembled and disassembled for future reuse. The 4th General Assembly meeting of FISSAC will take place at the end of March 2017 in the United Kingdom. More information will be made availabe on the website closer to the date. The FISSAC website is now also available in 10 languagues! Simply select the language of your choice and don’t hesitate to contact the partnership with any questions. The VEEP project was launched in October, including member of FISSAC within the consortium. The main objective is to develop and demonstrate a series of technological solutions for the massive retrofitting of the built environment, aiming at cost-effectively redusing building energy consumption. This project has recieved funding from the European Union’s H2020 research and innovation programme under Grant Agreement N°642154. In order to subscribe to subsequent newsletters, please fill in the Get Involved form.